With all the available smartphones, MP3 players, tablets, etc., it's easy to take your favorite music along with you on your adventures. However, most of these devices have small speakers or rely on the use of headphones. These playback options may be sufficient for a single person to enjoy the music, but they often aren't enough to allow multiple people to listen. We designed the Senta-Ally to be a versatile sonic companion that can deliver great sound on the go. Weighting in at just under 10 ounces, its lightweight design makes traveling with the Senta-Ally a breeze. 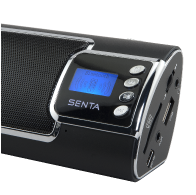 The Senta-Ally has 4 audio streaming modes plus a built in FM radio. 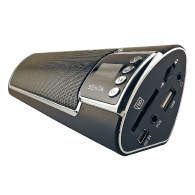 Smart phone and tablet users can take full advantage of the Senta-Ally’s Bluetooth® connectivity and stream audio wirelessly; the Senta-Ally even has a speaker phone feature allowing you to answer calls directly from it. In addition to wirelessly connectivity, it also has a line-In so you can connect with external audio players via an 1/8”x1/8” cord (included). Got some audio files on a flash-drive? Not a problem, the Senta-Ally can accept USB/SD cards and can play .wav and .mp3 files from them (we have used up to 16GB sticks and cards). Lastly, if for some reason your phone/tablet runs out of battery, you have played everything you got, there’s a game on, or you need something different, the built in FM radio gives you one more avenue to get some audio wherever you are. The Senta-Ally features an LCD screen which makes it easy to select files, navigate the various menu features and see track information (USB/SD only). Additionally, if connected via Bluetooth to a smartphone, the Senta-Ally will display incoming call information. We designed the Senta-Ally to be compact, lightweight and portable but with the biggest sound we could possibly squeeze into the package. With two full-range drivers whose performance is enhanced by a tuned-passive radiator, it delivers crisp, full range stereo sound and bass performance that defies its size. 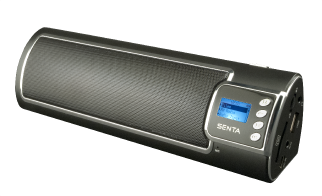 Indoors, the Senta-Ally can effortlessly fill a medium-large size room with sound. This makes it ideal for use with laptops, tablets, portable gaming, and casual listening or for situations where you may be moving from room to room and want to easily take the sound maker with you. For outdoor uses, weather permitting*, the Senta-Ally has incredible vocal projection and a wide listening field. It’s great for listening to the game or music while BBQing, camping, hiking, gardening, having a picnic, hanging out or washing/working on the car in the driveway. These are just a few ways that we have used the Senta-Ally and we keep finding more every day. 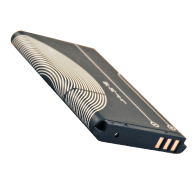 The Senta-Ally runs on a rechargeable Li-ion battery (included and replaceable). We tested the battery life under a variety of situations and circumstances. The approximate run-times are based on our testing and not mathematical projections: Low Volume USB/SD/Aux-In/FM Radio = 12 hours**, Medium Volume = 9-11 Hours, Maximum Volume = 4-6 hours. Bluetooth operation takes a little more power so runtimes are a little lower: Low volume 8-10, Medium volume 6-10**, Maximum volume = 4-5 hours. ** Play time does vary depending on what you are listening to. Bass heavy music will consume more power thus the runtime will be on the shorter side of the projections. The Senta-Ally playing Talk radio programs or forms of music that are not bass heavy will have a runtime closer to the longer runtime projection. The Senta-Ally comes with everything you need to get started: rechargeable Lithium Battery, 1/8” by 1/8” stereo cord for connecting to an external device (for instance, if you have an mp3 player that doesn’t have Bluetooth or removable USB/SD, you would connect to the headphone jack of the device and run it to the Aux-In on the Senta-Ally), USB charging cable, carrying strap and a plush carrying bag. All of this comes in a durable, reusable, magnetically latching gift box. In addition to being made to protect and store the Senta-Ally, we designed the box to have other uses if storing the Senta-Ally in it isn’t needed. It is perfect for storing cables, adaptors, small craft projects, pens, pencils, change, printed photos, check books, toys, etc…it’s a nice box. And another thing that comes in that gift box is: a 60 day satisfaction period, a 1 year warranty, and the best customer service you can find. We acknowledge that describing how something sounds through words and text is difficult. We encourage you to try the Senta-Ally and hear it for yourself. 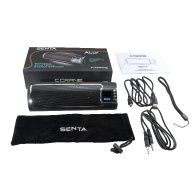 For more information about the Senta Ally, or to purchase, Click Here. Want to learn more about Wireless Audio? Click Here. *Bluetooth is a trademark of Bluetooth SIG.